Whitsand bay was the scene of many a shipwreck in the days of sail when gales drove vessels off coarse when trying to make Plymouth Sound. Fine sandy 3 mile stretch of sandy beach backed by slate cliffs, reached by paths at Freathy, Tregonhawke and Tregantle. Access at Tregantle is occasionally prohibited when the firing range is in operation (red flag). Cliff top car park and refreshments at Freathy. Rip currents can make bathing unsafe at times. The bay is patrolled by lifeguards based at Tregantle in August, and Tregonhawke from mid-June to mid-September. 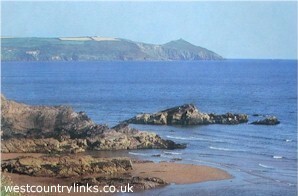 Whitsand bay is a fine stretch of sand almost 3 miles (5km) long. Dogs are welcome on Whitsand beach all year.